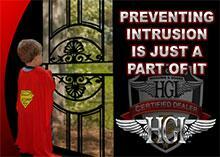 Home Guards Ornamental Iron Storm and Screen doors have been used for over a quarter of a century! Home Guard Industries has been designing and building Ornamental Iron Storm and Screen doors for over a quarter of a century. 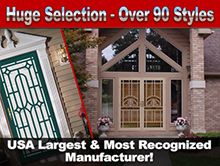 As the nations largest and most recognized manufacturer, Home Guard has produced over one half million doors on homes and businesses today. 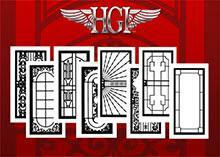 Home Guard has five unique Series of doors (over 90 styles) including the new laser cut designs to match almost any decor or taste. 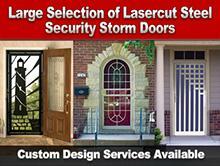 Home Guard also offers design services for custom styles if desired. All HGI doors are hand welded, hand polished, bathed in a six stage washer and then powder-coated with one of eighteen stock finishes. Home Guard industries has been designing and building Ornamental Iron Storm and Screen doors for over a quarter century. 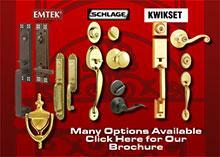 Most handle sets are available in a variety of finishes, including bright brass, antique brass, antique nickel and satin nickel. 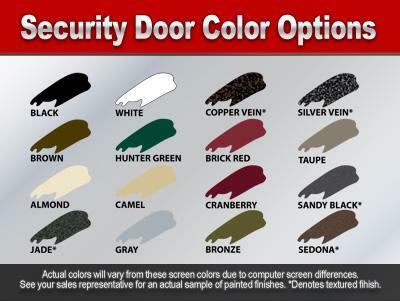 Our tempered safety glass features powdered aluminum frame and bulb seal for air tight weatherproofing enforced with our heavy gauge metal door frame. 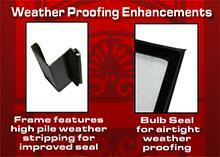 This frame features high pile weather-stripping for an improved seal and high security.